Algeria suffered its deadliest ever air catastrophe Wednesday when a military plane crashed after takeoff, killing 257 people on board, mostly army personnel and their family members. 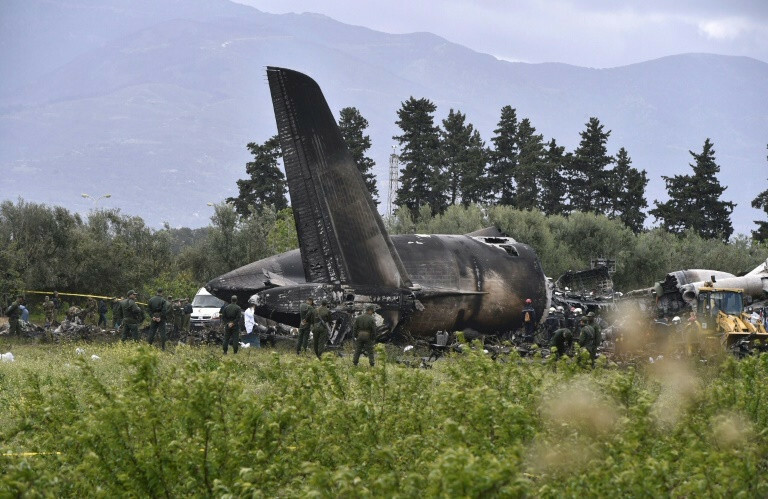 An AFP photographer at the scene saw the charred wreckage of the plane after it caught fire in a field near the Boufarik airbase, 30 kilometres (19 miles) south of Algiers. Witnesses who had been working in nearby fields told AFP that the plane had burst into flames before it hit the ground. Algerian President Abdelaziz Bouteflika declared three days of national mourning over the crash starting Wednesday. The veteran leader also ordered that a special prayer be said for the victims after weekly Muslim prayers on Friday, a decree published by state press agency APS said. The Tindouf region is home to refugees from Western Sahara and houses the administrative offices of the Sahrawi Arab Democratic Republic declared in 1976 by the Algiers-backed Polisario Front which seeks independence for the disputed region. Among the victims of the plane crash were 30 Sahrawis, "the sick and their companions, men, women and children, who had been returning from treatment in Algeria", said the Polisario. According to the plane manufacturer's website, the IL-76, a four-engine plane built in the Soviet Union and then Russia, can transport between 126 and 225 passengers depending on the model and configuration. 0 Response to "257 dead as military plane crashes in Algeria's worst air disaster"